We are pleased to welcome H.E. 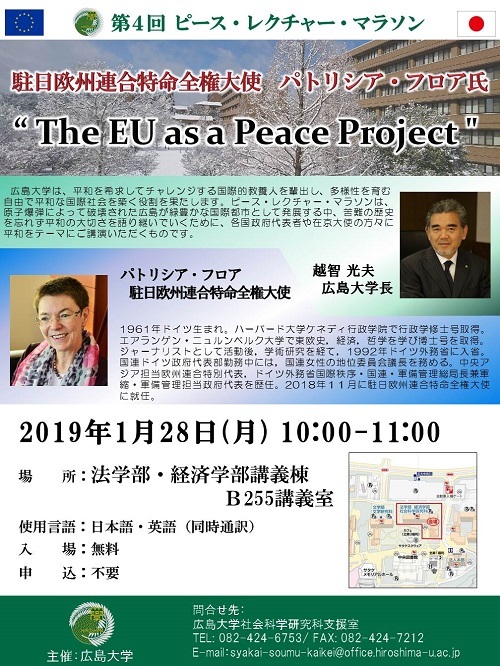 Dr. Patricia Flor, Ambassador Extraordinary and Plenipotentiary of the European Union to Japan, to give a lecture as follows. Please don’t miss this opportunity. In order to fulfill its mission to create a diversified, free and peaceful global community, Hiroshima University aims to cultivate “peace-pursuing, cultured individuals with an international mindset and a challenging spirit”. We have organized a series of lectures titled “Peace Lecture Marathon” where government representatives and ambassadors in Tokyo are invited to give a lecture on peace. With these lectures as momentum, we hope that new generations, who are currently enjoying prosperity in the City of Hiroshima, which has been reborn from the atomic destruction of World War II as a world-class city with natural scenery, learn a lot about the importance of peace and our history of hardship.